Hi, this is Chris Shattuck with "buildamodule dot com" and I'm going to be talking about how to test your module. Today we're going to be talking about how to test your module using the "Selenium IDE. Now it sounds a little weird, but in practice it's pretty simple to use and it can be extremely powerful. So, when we are building out our module or developing in Druple in any way, we're testing all the time. you know, we're refreshing our browser page, we're going to different pages, running through different work flows repeatedly to see if the things that were working before are still working, and to check our new functionality and to see how it fits in all of that. But when we're doing this, it can kind of get wearisome. And when things get wearisome, we end up sort of dropping the ball a little bit and maybe missing some things that we should. Automation has the advantage of saving you time and of making your work more accurate. So we want to get out of this system of, you know, running through every test that we're going to do ourselves every time. 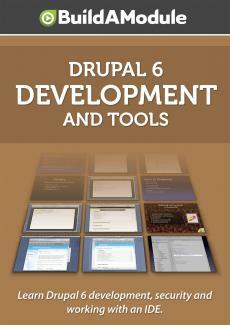 So we have two tools at our disposal in Drupal. One is a Selenium IDE for Firefox and this works for any application, but you know because we're, we're working with Drupal, we're going to show you how it applies to, to some typical Drupal module, one particular Drupal module work flow. And secondly, there's "SimpleTest" and SimpleTest is very awesome and we'll talk about that in a future video. But the two are, are rather different in their scope and have some different benefits and some things that aren't so great about them. So, let's take a look at Selenium IDE from a pro-con standpoint. What, what is it that makes it good? What are some things that we have to watch out for? Maybe you want to use something like SimpleTest for. What Selenium does is that it automates browser activity. First of all, Selenium IDE has a low overhead in terms of getting started with it. Understanding it's basic concepts and creating your first test is going to be really easy. SimpleTest on the other hand takes a little bit more work to get used to, even though it's still not that bad. And like I said, we'll go over that in a future video. One cool thing about Selenium is that as a test runs. Firefox, if you've got Selenium on and you're a web developer, you've probably got quite a few other extensions on and Firefox can be kinda slow in processing each page request. So, it can be slow. A couple things that can help this is turning off Firebug, if you're using Firebug. And turn off, or leave on page caching if you're using the web developer tool bar. So we want to make the load as quickly as possible. Those are two of the big things that can slow you down. Selenium can be kind of picky and touchy when it comes to doing particular types of tests, so sometimes you end up failing on certain tests when really they're not quite a fail and that can be a little hard to get used to. Once you do, and can work around it, then you're, you're golden. And finally, it's a little difficult to integrate Selenium IDE with a module and bundle it up. So with SimpleTest, you can just integrate the test right in and you just install a module called "SimpleTest" and it'll run the test for you. No problem. But with a module, in, with, a module testing in Selenium IDE, you're going to need to bundle up the Selenium test with the module if you want to expose it to users. Which typically, you won't need to do. But for the developers, if you, if you have multiple developers working on it, then sharing those tests back and forth can be a little more challenging that with SimpleTest. Ok, let's go ahead and get started and run our first Selenium test. The first thing that we're going to need to do is install the Selenium IDE Firefox extension. The page where we're going to get that is here and I'll put the URL on the top of the screen so you can see. But you're basically just going to go to this page and download the Selenium IDE Firefox extension. And that will load up everything that you need in order to run Selenium IDE. Pretty cool. The next thing that we're going to need to do is identify a test case. So, one, one, one thing you can do when you're testing this out is to identify a test case for a module that you use on a regular basis before you, if you're, don't have one that you're, you need to test right now. So, what I've done is enabled the "Masquerade" block on the side and what we want to do is, is test to make sure that when we masquerade as someone, somebody else, that it actually works and then, that we can go back to our, our user page. So this is just "does masquerade work using the block input there? ", so that's our test case. Ok, next step is to record our actions. So let's go ahead and open up Selenium IDE by going to "Tools" and then "Selenium IDE", and that will pop up this little box here. When you open it up, it starts recording right away so that's something to keep in mind when you're, when you're running your test. I've created a "testuser". And so I'm going to go ahead and masquerade as that one. I clicked "Go" but we have to click "Go" twice with the automated, with auto complete. Ok, so here we have, it's says "You are masquerading as "testuser". So if we go to our user page, let's go ahead and go to our user page, it should say "testuser" in the heading. So here's we've recorded our test and you can see over here, how it's working. So first of all, we opened up the default page on our website and our website URL is assigned up here at the very top. And this is one little "gotcha" if you're using this to test on multiples URL's. So if you're running the same test here as you are on say a production site, then this, this, you have to change this base URL each time you run it. So that's something to keep in mind that can be a, a pain if you, if you keep running test on production when you meant to run them on a development site. And then we typed into this input, the value "testuser". We clicked the "Submit" button. And we clicked it again. And apparently, it doesn't record when you change the URL in the address bar and go to that page. So we'll have to add that in. The command here is "open", which we saw in the very first command here. And we're going to open up "backslash user". Ok.
And then finally, what we want to record is "switching back", so we click the switchback" button, and now we want to make sure the "admin" is the, is the, the title here. What we've recorded is the basic setup, so now what we're going to need to do is to add a command manually to this test. So we need to slip out of our recording mode by clicking the "now recording" button, so it's not highlighted now so we know we can just freely work through this site without accidentally recording any of that action. And what I'm going to do over here is actually select "admin" and I'm going to right click it and go down to this context menu called "Show All Available Commands". And here it shows a bunch of available commands that we can, we can call in this particular part of the page in Selenium. So we recognize this one.